If you've ever looked at Conquent's branding, you'll notice we keep a pretty low profile. It kind of gets into my philosophy of "it's complicated enough, let's not make it any more complicated." But every now and then, something happens that's pretty cool and I feel like I really have to toot the horn. As you may know, I post for Roger Sterling on Twitter; it's a side gig, but I've learned a lot, and the Conquent team has gotten to play with technologies we wouldn't otherwise be looking at. There are lots of people involved, some are agency folks, some are fans who do it purely for the love of the characters, and some, well, I have no idea who tweets for the dog or the toilet. It's really an amazing facet of the Internet. AMC has nothing to do with what is one of the more remarkable outreach campaigns online. 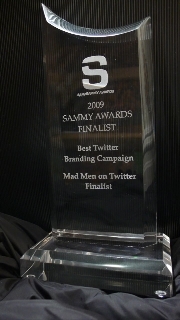 Not that everyone involved agrees that it's a campaign at all, but we've seen people get into the TV show because they got into the banter from the Twitter characters, there's been mainstream press about the twittering and now, the Mad Men Twitterers have done another first -- the fans got an award for a campaign. The project made it to the final three, up against the green M&M and a travel site. The judges said they were overwhelmed with submissions, and I know there's a lot of great stuff going on out there in the world of branding on Twitter. To have this ad hoc group beat out major agencies for a seat with the Finalists is a great honor, and a great insight into how Social Media changes the rules, or maybe just doesn't know what the rules are. I post for @EdieAdams and was at the "It's a Mad_World" event at Radio City. Your take on this is excellent -- fans getting an award for a brand fiction campaign that's not a traditional campaign. Breaking rules. Congrats to all, especially the Mad Men gang.